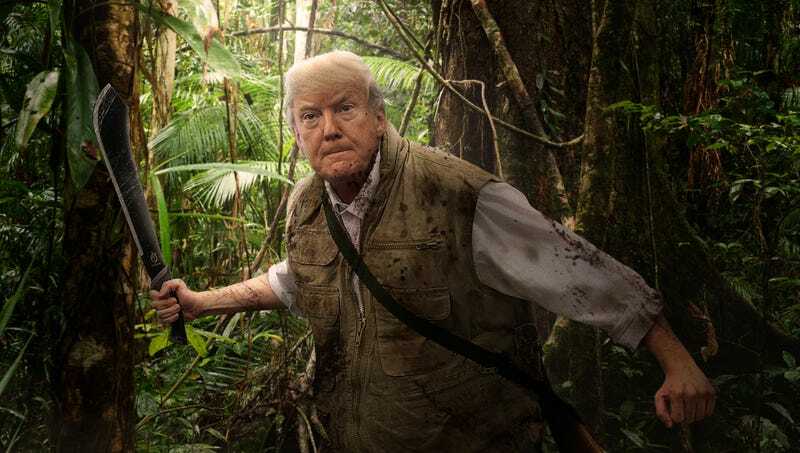 TALAMANCAN MONTANE FORESTS, COSTA RICA—Venturing deep into rainforest no outsider has dared explore, President Trump slashed through the thick vines of a Central American jungle Monday in search of a previously unknown ethnic group to vilify. “Legend has it that this land is home to a lost race of people living in complete isolation, and if I can manage to find them, I will be able to stereotype them in any way I choose,” said the machete-wielding commander in chief who was wearing a tan field jacket as he led a group of loyal Republican allies through the oppressively hot and humid thicket in search of the mythic tribe. “This discovery could change everything. These people remain entirely untouched by any media coverage whatsoever, so I can easily stick them with the blame for our nation’s drug problems, violent crime, stagnant wage growth, you name it.” Upon sighting the uncontacted tribe, Trump’s reelection team reportedly took grainy black-and-white videos of them for immediate use in menacing campaign ads.